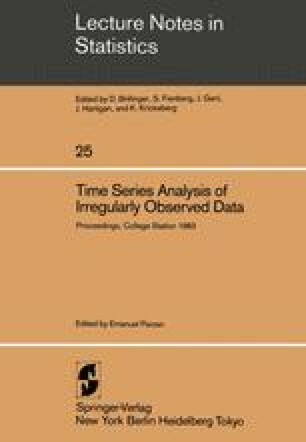 Using state space representations, the author’s previous work on fitting continuous time autoregressions to unequally spaced univariate data is extended to several multivariate models of practical importance. Continuous time multivariate first order autoregressions and the limiting case of multivariate random walks are used to model multiple medical observations collected at unequally spaced time points. Mean levels can be included in these models as constants to be estimated or as random variables with prior variances. Maximum likelihood estimation of the unknown parameters allows the development of individual normal ranges so a physician can be alerted if a set of observations is out of line. Three examples based on medical data are presented. Extensions include optimal control when drug therapy is involved. Another application is transfer function estimation from unequally spaced data. A bicycle rider pedals against a load which varies as a stationary process. Various respiration gases are measured on a breath to breath basis which are unequally spaced in time. The transfer function of the body indicates the mechanisms of the body’s response to exercise.